Macrophage myofasciitis is characterized by histopathological lesions (disease affecting the tissues). These are myopathic consequences, which affect the muscle tissue. This disease has been described following a human biopsy, an adult patient and in 3 children. 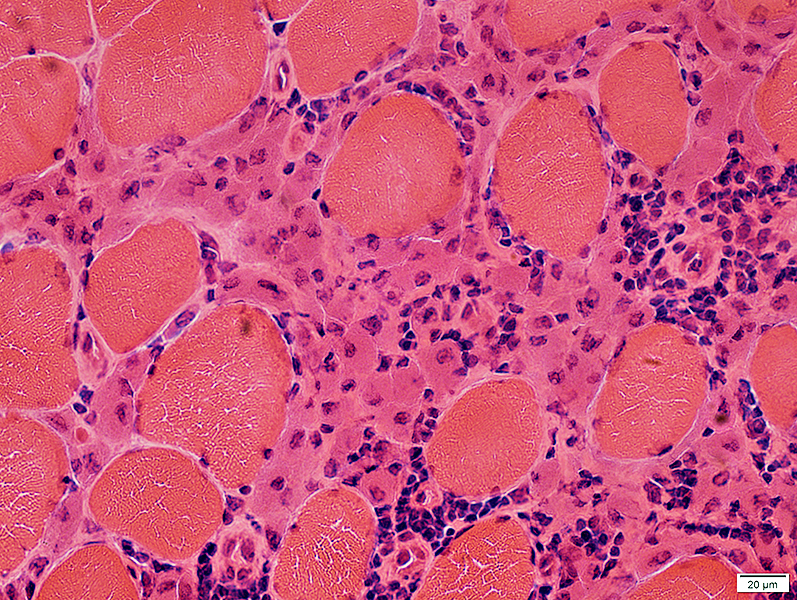 Damage within the muscle fibers was put forward without the presence of necrosis. Examinations of these lesions (nuclear microsondes, radiographic microanalyses, atomic absorption spectrometry) made it possible to understand that these damages were composed of aluminum salts. These substances are widely used in a large number of vaccines administered intramuscularly. It has also been shown that there is no underlying reason for the disease. Indeed, healthy people (not sick, having a healthy lifestyle, etc.) can be affected by the disease following a vaccination. Initially, the exact origin of the disease was not known. Suspicions about an environmental, infectious and other cause had been raised. Scientific work carried out between 1998 and 2001 determined that the exact cause of the disease was the absorption of aluminum hydroxide in the vaccines. Microscopic imaging examinations of internal components: macrophages have shown the constant presence of inclusions caused by these aluminum salts. These compounds are used as adjuvants in vaccines. Macrophage myofasciitis is found exclusively in the deltoid in adults and quadriceps in children. – cognitive abnormalities, long neglected consequences in the disease. These manifestations result in depression, decreased cognitive and intellectual performance, attention disorders, and so on. Other characteristic signs may also be associated with the disease. These include psychiatric manifestations, particularly mood disorders. Dyspnea (breathing difficulties) and headaches have also been found in some patients. 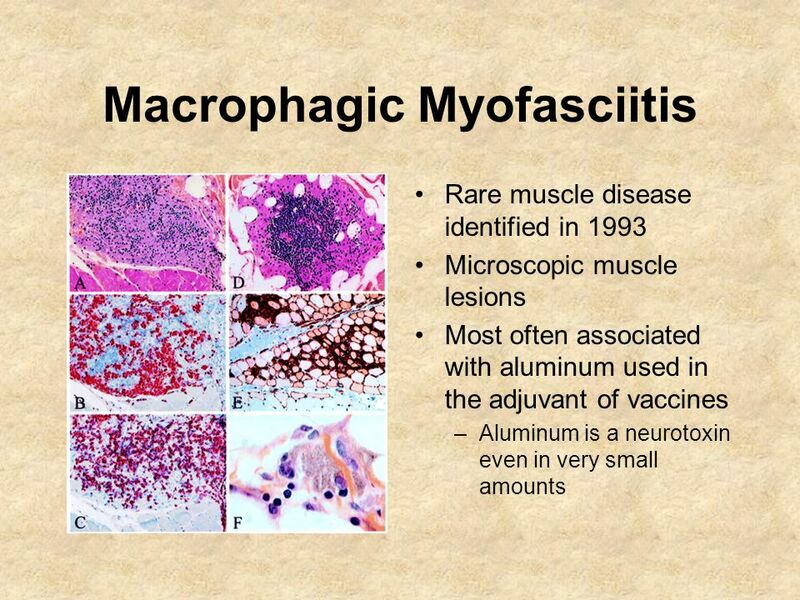 The origin of the disease is the presence of aluminum hydroxide within vaccines injected to patients by the intramuscular route. Macrophage myofasciitis affects men and women, adults and children, without any particular underlying condition, following vaccination. Adults are usually concerned after a vaccine in the deltoid, while children are affected after an injection into the quadriceps. 3. the hepatitis A vaccine: 19%. In addition, it has been shown that the presence of aluminum salts in the body is persistent. Either the biopsy of the muscle tissue can testify to the presence of these compounds whose origin a vaccine is dating back several years. It also seems that there are predispositions in some people, not allowing them to properly eliminate the aluminum salts found in vaccines and in this sense, see them accumulate within the muscle tissue. Individual risk factors for the development of the disease have not been clearly identified. A link between systemic symptoms and the development of the disease has been highlighted in a small proportion of cases of macrophage myofasciitis. In addition, genetic predispositions have been suspected, particularly in repeated cases of the disease within the same siblings. Some scientific research has shown that a particular gene pool may have an impact on the persistence of aluminum salts in muscle tissue. The pathology is characterized by an increase in circulating CCL2 / MCP-1, a cytokine involved in the penetration of nanoparticles into the brain. Genetic modifications within genes encoding this molecule may be an additional risk factor for developing the disease. The diagnosis of the disease is made according to different clinical signs more or less visible. Indeed, the first relates to the presence of aluminum salts, from a vaccine injection, in the muscle tissue. In addition, the presence of myalgia (muscle pain) in the deltoid associated with the identification of aluminum hydroxides within this tissue, and the evidence of the development of pathology in adults. The determination of clinical manifestations (chronic muscle pain, chronic fatigue and cognitive abnormalities) also makes it possible to ask whether or not the diagnosis of the disease is made. The positive diagnosis of the disease involves the detection of deltoid macrophage lesions in adults and quadriceps in children. In 1/3 of the cases, an increase in the plasma creatine kinase level is characteristic of the pathology. Nevertheless, this abnormally high cytokine level may be related to other inflammatory diseases or the immune system. In this sense, additional examinations to eliminate any suspicion of another cause must be made. Electrodiagnosis, MRI (Magnetic Resonance Imaging) of the muscles generally allow to approve or not the first opinions.